In making plans to reduce clutter and organize storage space, it is extremely important to pay attention to the placement and space requirements of any and all electrical installations, including wiring. 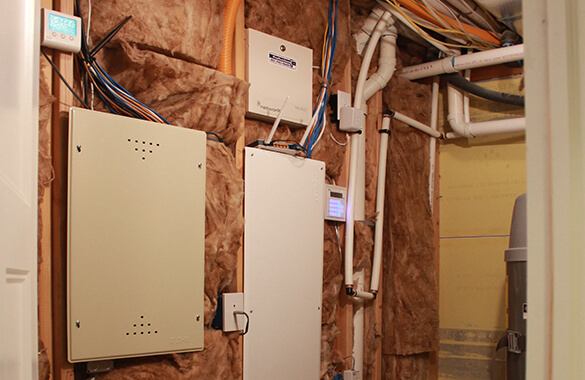 This post – third in the “Storage 101” series – provides information to assist you and your family in safe, code-compliant use of your basement for storage so that electrical hazards are minimized. Here are a few tips. 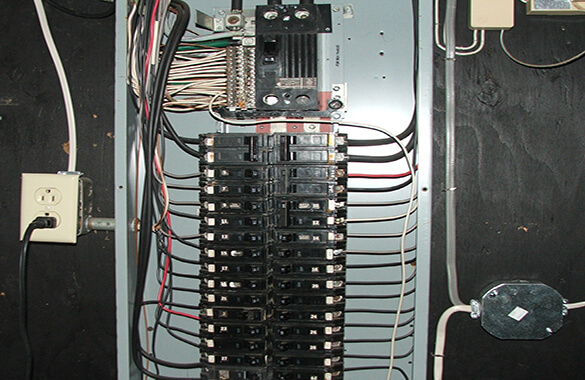 Install breaker boxes and electrical panels where they are easily accessible. There must be open space in front and to the sides at all times. The minimum requirement is an open area that is 30 inches wide, 36 inches deep and 6.5 feet high. Make sure that all appliances are properly grounded. Size doorways to mechanical rooms large enough that any appliance you may keep there will easily pass through. Ensure an adequate supply of combustion air and return air for your basement furnace without drawing air from a bedroom, bathroom, or storage room. Install an extra egress window in an area adjacent to the mechanical room if needed. Install at least one light in your furnace room, laundry room, and the area where your breaker box or electrical panels are kept. You should also install a ground fault circuit interrupter, or “GFCI,” outlet. This type of outlet contains a breaker that will quickly cut off electricity to anything plugged into the outlet should a ground fault or electrical short occur. Check into and follow all electrical codes that apply for your area. States vary in what version of the National Electrical Code they have adopted. DON’T install any type of thermal insulation within three inches of a recessed light fixture, wiring compartment or ballast. DON’T store items next to electrical motors, clothes dryers or other heat-producing equipment. DON’T install overcurrent devices such as electrical breaker boxes in clothes closets or in near any material that ignites easily. Doing so is in violation of the National Electrical Code, or “NEC.” Sparking or heat from the flow of electricity can cause stored materials to burst into flames. DON’T store anything where it might cut into wires, and don’t touch bare wires or wiring that has frayed insulation. Uncontained electrical current may suddenly deliver a severe shock or electrical burn. It also may start a fire. DON’T store anything on top of wiring or hang anything from wiring. DON’T pick up or touch anything that runs on electricity if your feet are wet or any part of your body is touching water. Electricity flowing through water is deadly. Never try to put out an electrical fire with water. If you are considering an electrical system that is off grid, you likely will want a battery bank to store the electricity supplied by solar panels, a windmill, a water turbine, or a generator. When used with an inverter or controller, the battery bank allows you to supply your home with consistent power around the clock. Construct an enclosed battery box to house the battery bank, or build a small separate room with its own ceiling in one corner of your basement. If the type of batteries you choose produce fumes, vent the box or room to the outdoors. This can be done inexpensively with PVC pipe. Elevate the batteries so that they are not on the basement floor. Rough-cut planks that are 3 inches thick laid across lengths of sturdily stacked 6-by-6 timbers provide a bench that is easy to assemble. With these tips, you are ready to make your basement safe from electrical hazards.